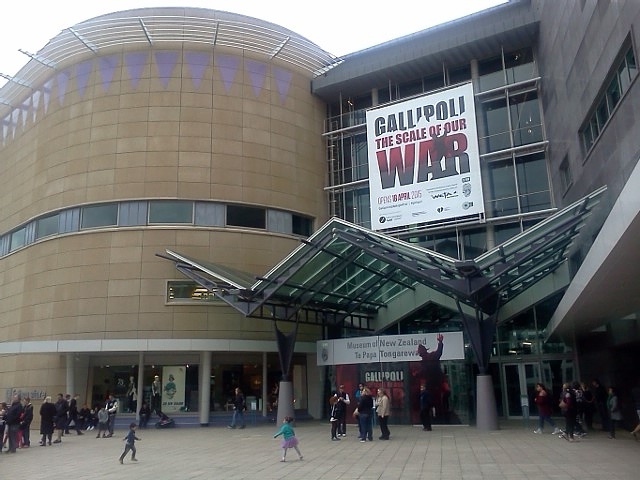 This morning I visited for the first time our brother exhibition, Gallipoli: the Scale of our War at Te Papa, the national museum of New Zealand in Wellington. This ground-breaking display was created by Te Papa working closely with Weta Workshop. I only had my old phone with me to take photos, but hopefully the following pics will give you a taste of what this exhibition is all about. Being a holiday weekend, the queue to get in was quite long. It took about an hour, snaking backwards and forwards like a ride at Disneyland. The exhibition only has capacity for 350 visitors, and they space them out in groups so there is room for everyone to easily see the displays. The staff told me that during the week there are often no queues at all, but weekends are busy, especially holiday weekends. On entering the exhibition, the first sight that greets you is this amazing larger-than-life model of Lieutenant Spencer Westmacott. He led his platoon of the Auckland Infantry regiment in the Gallipoli invasion on 25 April 1915, but his right arm was smashed by a bullet. It was amputated in Egypt, and he was sent to England to recover. 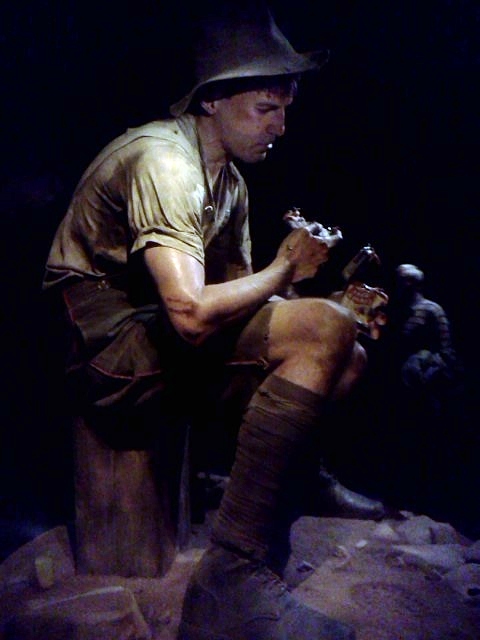 When we were working on our diorama for the other World War 1 centenary museum in Wellington, The Great War Exhibition. 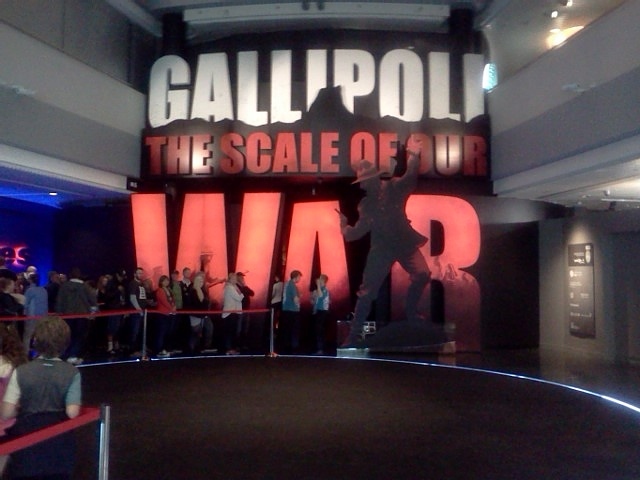 I had heard that Te Papa's exhibition was to be subtitled 'the scale of our war'. At the time, I thought that this subtitle should apply more appropriately to our exhibition with its massive diorama of 54mm figures. Little did I suspect they meant 'scale' in the other direction - models 2.4 times lifesize! This was a close-kept secret, only revealed on opening day. 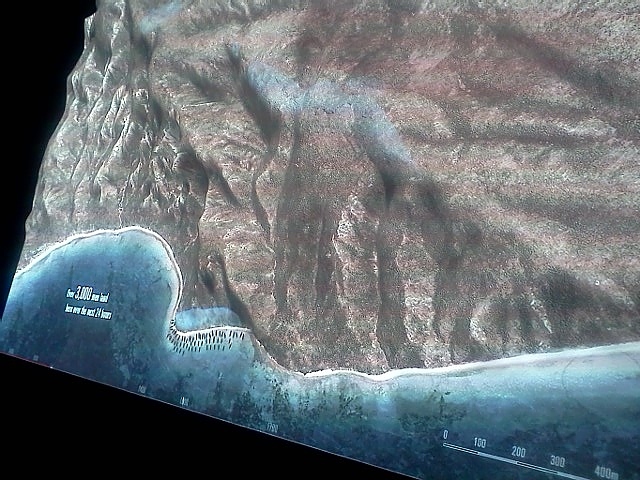 This electronic diorama of the Anzac landings uses computerised animations projected onto a 3D map. This is particularly useful for putting the whole confused battle into logical order. 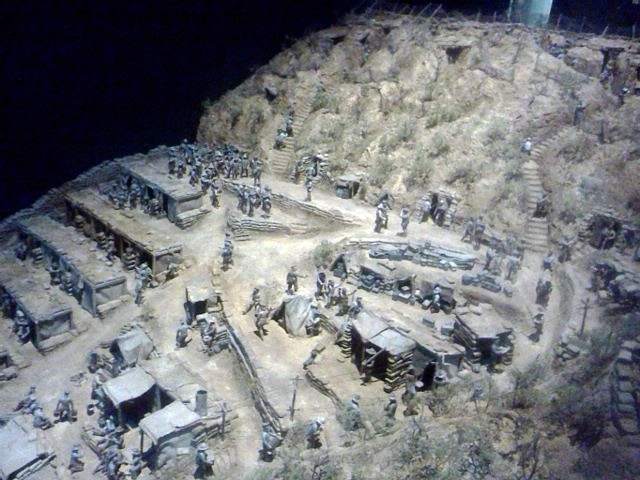 Another photo of the same diorama, showing a different stage of the invasion. The photo doesn't do this justice - even the sea is animated, with wavelets lapping the shore. 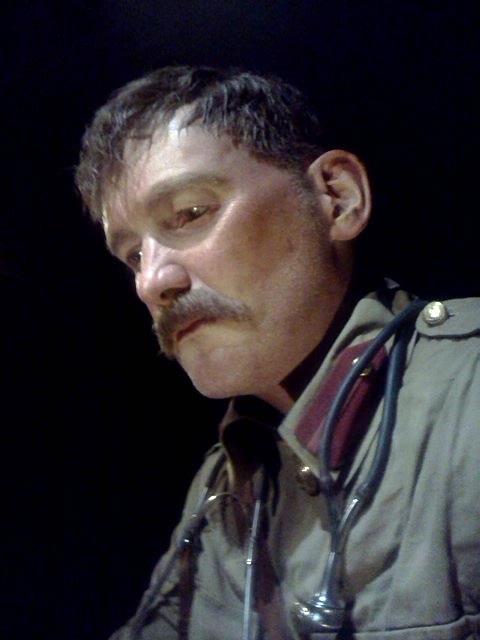 The next of the large models you see is Lieutenant Colonel Percival Fenwick of the New Zealand Medical Corps. He was among the first New Zealanders to land on Gallipoli on 25 April 1915. Throughout that day and night, he treated hundreds of wounded Anzacs on the beach, describing the scene as ‘hellish’. 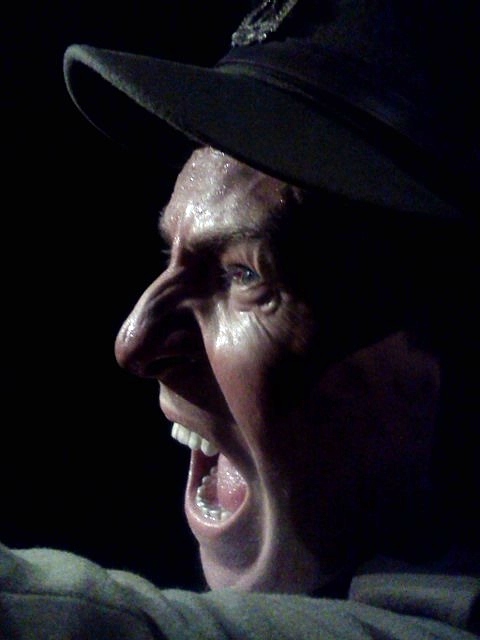 Fenwick was evacuated from Gallipoli, ill and exhausted, after two months. The detail is incredible - even his stubble is replicated on Fenwicks two-and-half times enlarged face. Here you see more of the amazing detail, including a giant fly. Apparently there were three species of fly in Gallipoli, so this is a model of one particular breed. Our exhibition isn't the only one with a diorama. 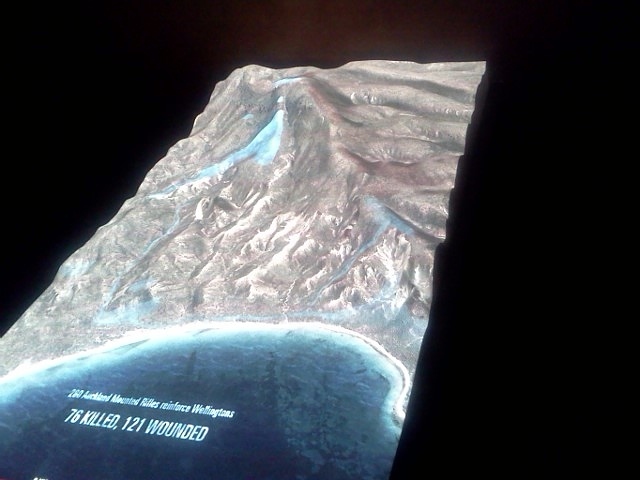 Te Papa has this spectacular, albeit much smaller, diorama of Quinn's Post. Down the slopes behind the trenches at the top of Quinn's Post you can see the fortified camp where the garrison lived. With the Turkish trenches often only 10 metres away, Quinn's Post was a weak spot in the lines. Lt Col William Malone of the Wellington Infantry Regiment set about rectifying this. Terraces and dugouts were built and extensive sandbagging protecting the previously exposed areas of the position were erected. I'm not sure of the provenance of the figures used in the display. But many of them appeared to specifically animated to tell the story. 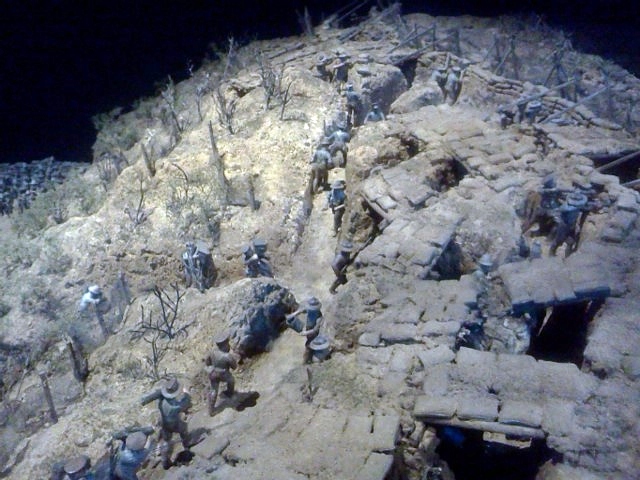 With a hint of hubris, I can say that whilst well sculpted, their painting is not up to the standard of those in our own Chunuk Bair diorama! 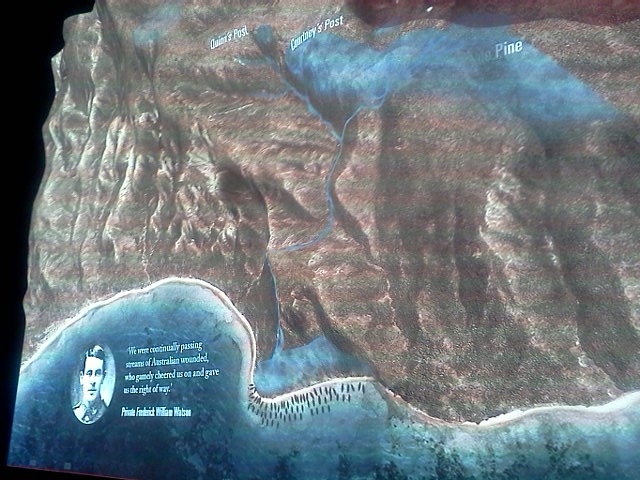 There is also this larger scale framed diorama that shows just how close the Anzac and Turkish lines were at Quinn's Post. 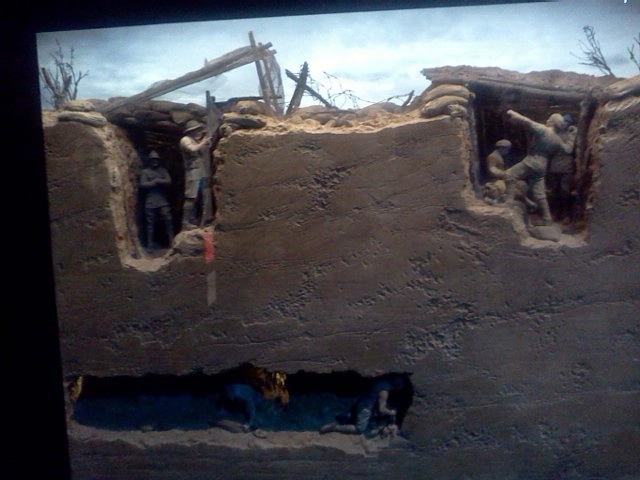 Note the anti-bomb netting over the Anzac trench, and also the tunnellers mining towards the enemy lines. 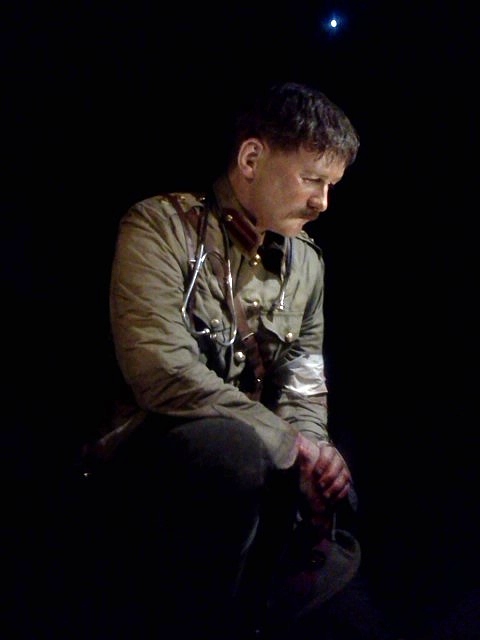 The next large model shows Private John Robert Dunn of the Wellington Infantry Battalion. He landed on Gallipoli with the battalion on 25 April 1915 and served there until July, when he was evacuated with pneumonia. He returned to duty still unwell and, on 18 July, was found asleep at his post, court martialled, and sentenced to death. The sentence was later commuted to imprisonment. But a few days after he returned to duty, he was killed in the attack on Chunuk Bair. His remains have never been found. I didn't photograph the section after the Dunn model, as this part was more sensory - a trench with throbbing sounds and flashes of gun-fire. 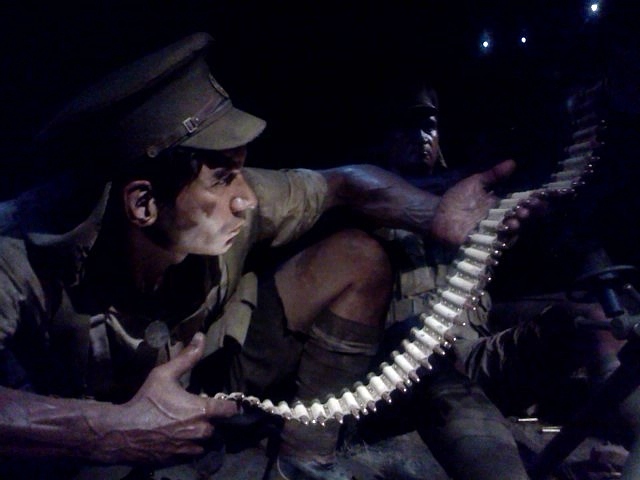 But emerging from the other side of the trench, you come to another larger-than-life tableau depicting the Maori Contingent Machine Gun Unit. 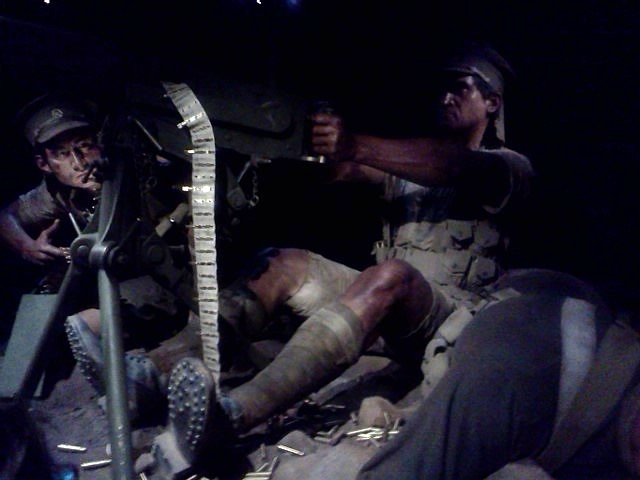 The gunner is Corporal Friday Patrick Hawkins (Ngāti Kahungunu), who took over as No. 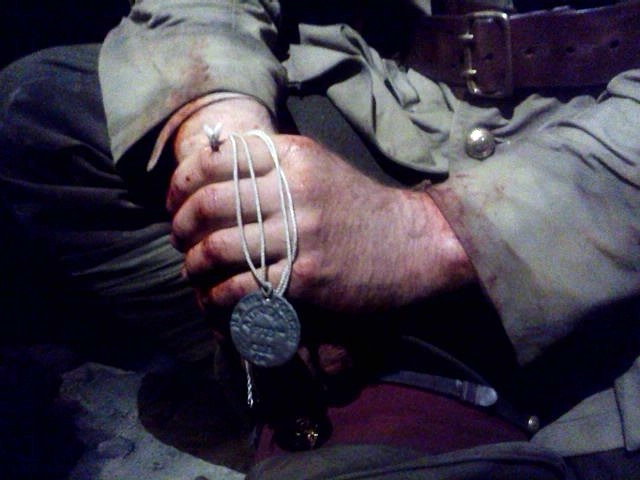 1 gunner when the original man was wounded, but before long a bullet through the wrist fractured his forearm. After Corporal Friday Hawkins was wounded. Private Rikihana Carkeek (Ngāti Raukawa), shown here feeding the gun, took over as gunner. But he was shot through the neck. He dragged himself down to the beach, where he was evacuated to a hospital ship. He returned to fight six weeks later. 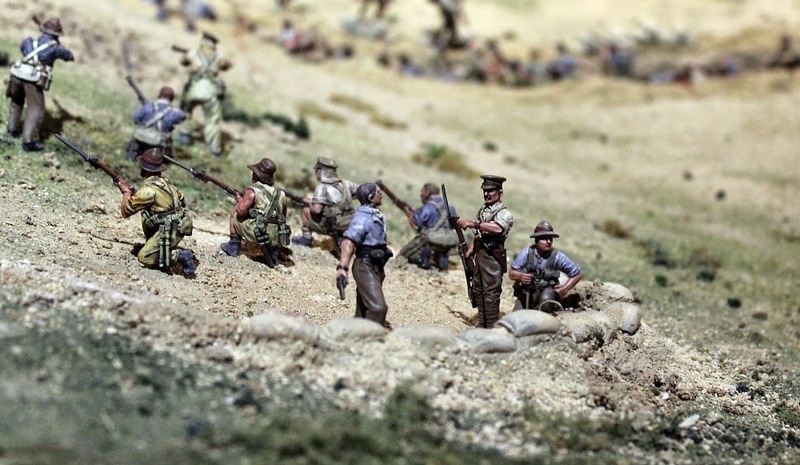 Another electronic diorama animates the story of Chunuk Bair. Of course, having been involved in putting together our own huge diorama of this battle, I found this especially interesting. It certainly made sense of the confusing narrative and timelines of this battle. 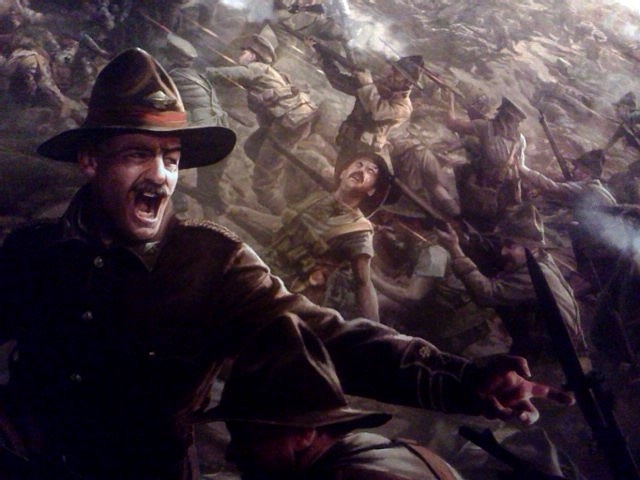 There are several wonderful huge paintings in the exhibition, including this one of Lt Col William Malone urging on his Wellington troops at Chunuk Bair, shortly before he was filled by friendly artillery or naval fire. Malone is often credited with introducing the now-iconic lemon-squeezer hat to the New Zealand troops. However it is interesting to note that in our own diorama we don't have him in a lemon-squeezer as here, but wearing an officer's standard peaked cap. One or other of us is correct! 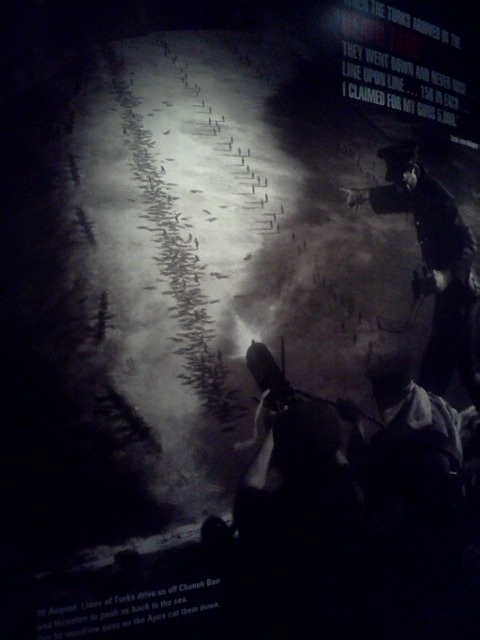 Another painting is this stark monochrome rendition of the machine gunners' view from The Apex as they mowed down line after line of Turks as they entered their 'killing zone'. 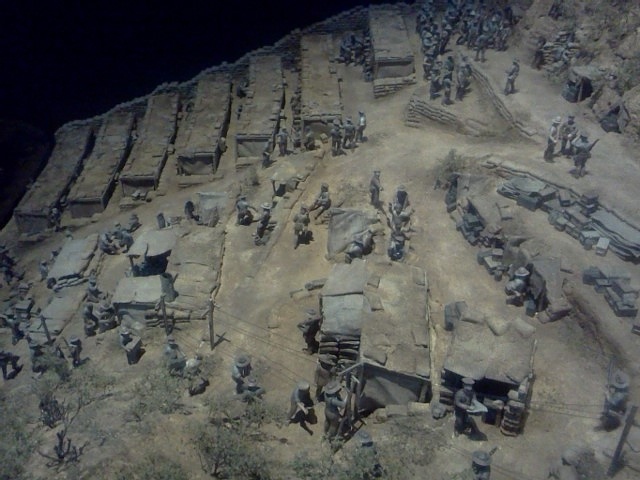 Besides the fighting men, their vital nursing support is also shown in another larger-than-life tableau. Staff Nurse Lottie (Charlotte) Le Gallais of the New Zealand Army Nursing Service on board the hospital ship Maheno. 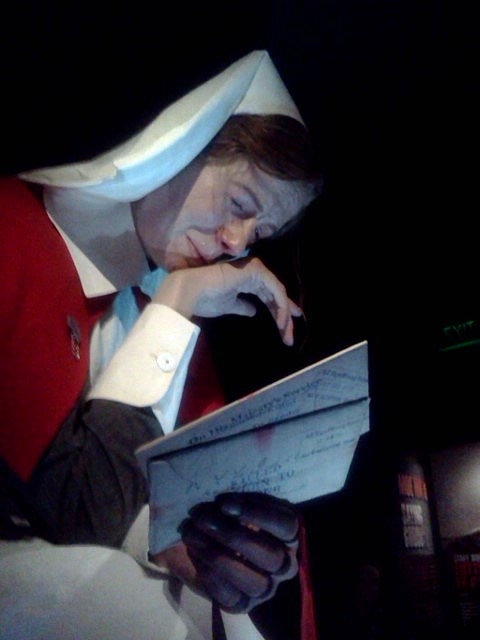 She is shown at the moment she found that her letters to her brother Leddie had come back to her stamped: ‘Reported killed’. He’d been dead four months, but only their family back home had received the news. 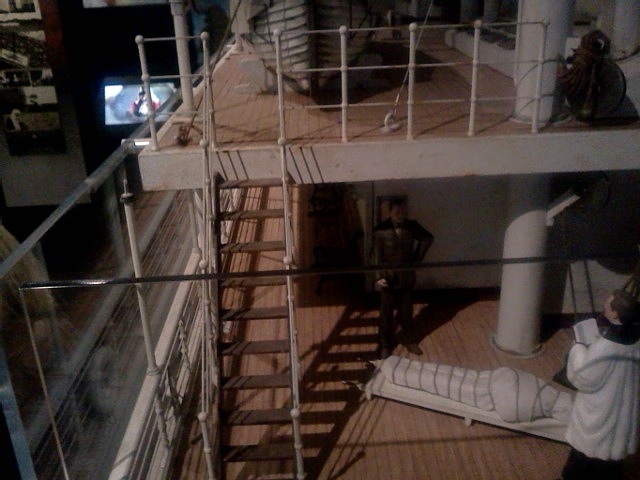 Here's a large-scale section of the hospital ship Maheno, a liner that had been converted into a hospital ship using money raised by an appeal by the Earl of Liverpool, the Governor-General. 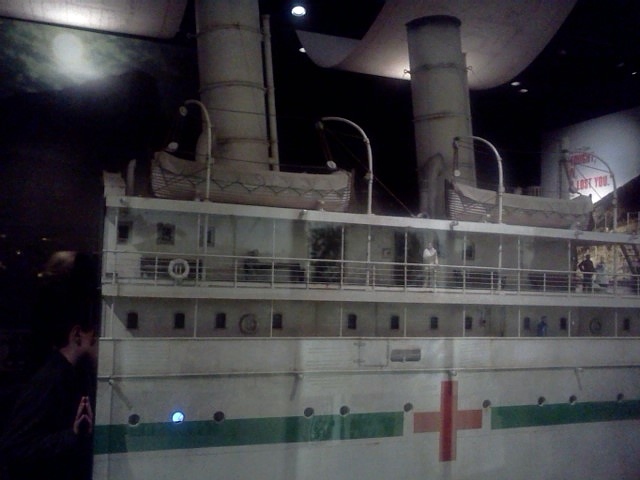 In accordance with Article 5 of the 1899 Hague Convention she was repainted white overall, with a broad green stripe along her sides, and large red crosses on the sides and funnels. 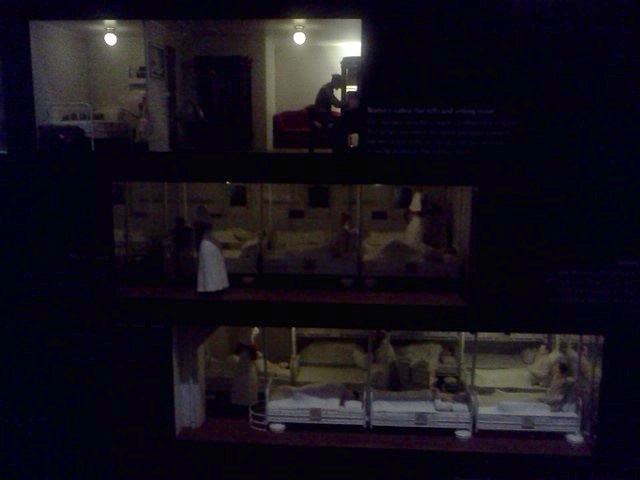 On the other side of the above diorama, you get a kind of dolls-house view of some of her eight wards and two operating theatres. Maheno had a medical team consisting of five doctors and 61 orderlies from the Army Medical Corps, a matron, thirteen nursing sisters, and chaplains. In just a month the Union Steamship Company removed and stored the Maheno’s luxury fittings, gutted many cabins and public spaces, and built operating theatres, X-ray rooms and specialist labs. 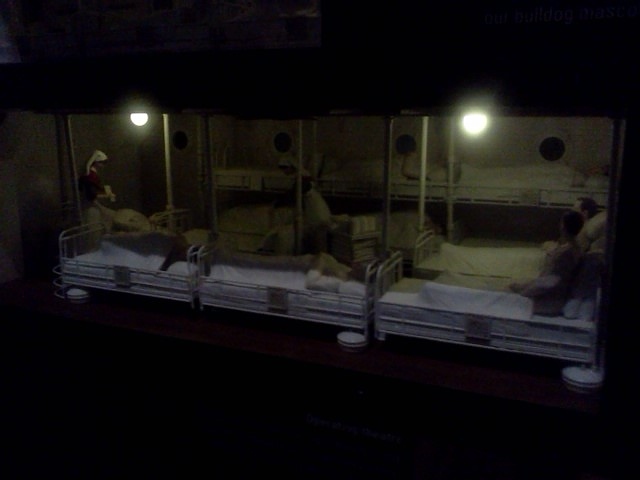 This is a model of one of the wards. A final picture of the Maheno model, showing one of her chaplains delivering a sad and lonely funeral service to one of the unfortunates from the Gallipoli campaign. 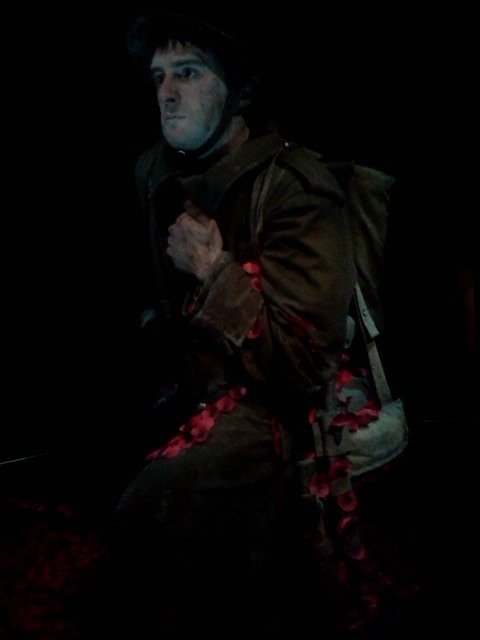 The final tableau as you exit the exhibition shows Sergeant Cecil Malthus of the Canterbury Infantry Regiment, after he was redeployed from Gallipoli to France with the New Zealand Division, Malthus was wounded on the Somme in September 1916, losing toes on his right foot to an exploding bomb. Visitors to the exhibtiion have festooned Malthus with paper poppies. 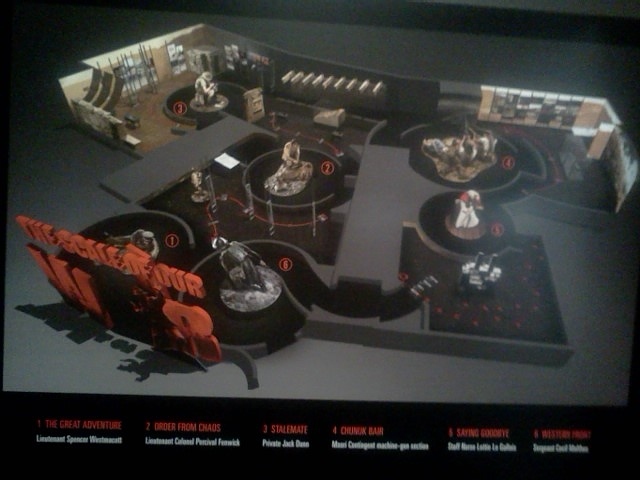 Here's a diagram showing the overall layout of the exhibition, which fits into a surprisingly small space. Exhibition creative director and founder of Weta Workshop Richard Taylor says he and his team were determined to create something unique to commemorate Gallipoli through their collaboration with Te Papa. Entry is free, thanks to a $3.6 million contribution from the Lottery Grants Board. 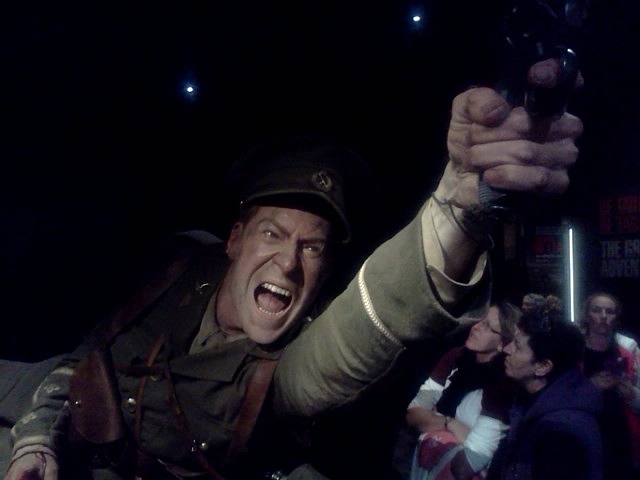 I thoroughly recommend you visit Te Papa and see this display. It's on for four years, so plenty of time for the queues to die down! With Gallipoli: the Scale of our War and The Great War Exhibition, Wellington is so fortunate to have not just one, but two world-class WW1 exhibitions, so the city is well worth a visit from elsewhere in New Zealand, or even from abroad. With reference to the Quinns' post diorama it seems overall to be a more subdued style rather than 'games workshop' style painting of the Chunuk Bair one, each has it's place, so possibly tiny bit of hubris called for.